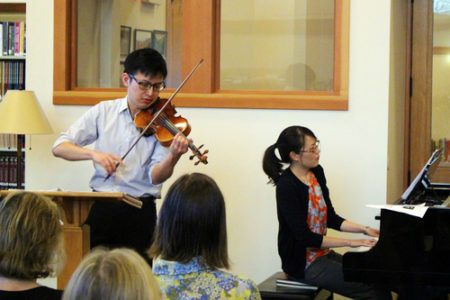 Pianist Juliana Han and violinist Wayne Lee are the husband and wife co-directors of the Piedmont Chamber Music Festival in the Bay Area, California. Our editorial director Anna Wu caught up with them to chat about the festival, the Formosa Quartet, and their journeys as musicians. Anna Wu: Hi Juliana and Wayne! Thanks for joining us today. Could you guys tell us a little bit about the Piedmont Chamber Music Festival? What inspired you to start it? Wayne Lee: The Piedmont Chamber Music Festival is about to have its third season this summer. It’s a week of chamber music concerts in my hometown of Piedmont, California, involving the two of us and a spectacular roster of musicians from around the country who fly in for the week. We do three feature concerts and a kids concert at the Piedmont Center for the Arts, as well as free concerts in Oakland at community venues like homeless shelters and retirement homes. Juliana Han: The idea to start PCMF started with a drive-by viewing – of the Piedmont Center for the Arts. Piedmont is Wayne’s hometown, and he mentioned what a great space it was for chamber music. We joked that we should start a festival there, but then we spoke to one of the board members, and they were totally on-board. So, we made it happen! AW: Piedmont is a really lovely city, but it’s much less diverse than the city of Oakland which surrounds it or New York City, where you both reside. At the 2010 census, Piedmont was 74% White, 18% Asian, and 1.3% African American. Have you felt this at all, either Wayne as a resident or while running the festival? WL: Yes, I’m much more aware of it now than when I was growing up. As a kid, that’s just the reality I was used to. After 17 years of being in New York City and riding the subways, it’s easy to see that Piedmont is a very exclusive community. At the same time, I will say that I remember a lot of tolerance when I was going through the schools there. From my limited perspective, the kids who weren’t Asian and white weren’t treated very differently. Same with the kids who were different in other ways – kids with disabilities, kids who came out of the closet in high school, etc. JH: The divide is something we’re very aware of. It’s a reason we do all of the community events leading up to the festival. Last year, we played in a few homeless shelters in Oakland, and connecting with those people was one of the highlights of the festival. There is no reason that classical music should be for a certain racial or economic class, but it often ends up that way. I think both of us believe that it’s our job as artists to remove the barriers as much as we can. The biggest hit at the homeless shelters was Schubert! Who doesn’t love Schubert? AW: So to back up for a moment, for those of our audience members who might have missed out on playing classical music growing up, what is chamber music, and why have you chosen to focus on that? WL: Chamber music can be loosely defined as music performed by a small ensemble – a trio or quartet or even an octet. “Chamber” refers to a room – like Harry’s Chamber of Secrets. It’s an intimate form of music-making that provides an ideal mix of artistic idealism and the social aspects of ensemble-playing. I play in two professional ensembles, including the Formosa Quartet, which is sort of the resident string quartet at PCMF, so I clearly believe in the ideals of chamber music. Audiences love it too for so many reasons – they get to be close to the action, unlike at an orchestra concert in a big concert hall. AW: Perfect segue! Tell us more about the Formosa Quartet, since those who know Taiwan might recognize Formosa as the old Portuguese name for Taiwan. WL: The Formosa Quartet started in 2002 when four friends who enjoyed playing music together put together a concert tour in Taiwan, the land of their shared heritage. They realized they had a pretty good thing going when they won First Prize at the London International String Quartet Competition in 2006, which is one of the biggest markers of recognition in our field. The quartet has had some membership changes in its 16 years, which is pretty normal. Our former members have joined some illustrious groups like the Juilliard Quartet, the Ying Quartet, and the New York Philharmonic. We still have two founding members who are of Taiwanese descent. Deborah, our cellist, is Korean-American. I’m Chinese American, but I feel like an honorary Taiwanese after joining this Quartet and marrying a Taiwanese American. I feel lucky to get to play music with some really great people. JH: As a Taiwanese American, it’s been great to have Formosa Quartet involved in PCMF because it’s another way I can connect with parts of Taiwanese culture that I’d never known. 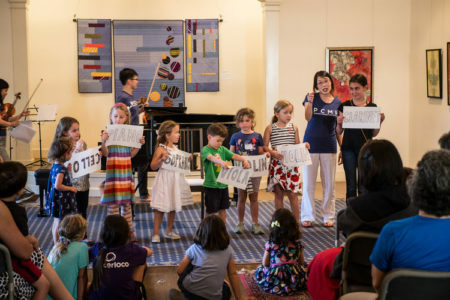 Last year, PCMF programmed arrangements of Taiwanese folk songs, the sort that all of our parents know and can sing along with, and it was a total hit. Growing up in Ohio and not knowing any of these songs, watching Taiwanese people get teary-eyed over these songs (played gorgeously by Formosa) made me feel a little more connected to the motherland. AW: And I hear that you have more of these Taiwanese folk songs programmed for the upcoming 2018 season as well. Tell us more about these arrangements. WL: Not a folk song, exactly! But it’s something as deeply Taiwanese. It’s an arrangement of Pasibutbut, which is a sacred millet harvest song of the Bunun tribe – an aboriginal Taiwanese tribe. The composer is Wei-Chieh “Jay” Lin, who also did the arrangements of the Taiwanese folk songs that we performed at PCMF last year. Pasibutbut is known all over the world for its beauty and astounding, intuitive harmonic complexity. Among the Bunun people, it’s usually sung by a group of men in a circle – they sing a major triad and slide up an entire octave in half-steps with this triad, making an incredibly mesmerizing sound the whole time. Jay happened to be my roommate my first year at Juilliard. When I reached out to him after joining the Formosa Quartet in 2012, asking if he could write a piece based on the Pasibutbut, it turned out that he had been wanting to write this very thing for a long time. He already had the whole piece mapped out in his head, and he got back to us with a finished product after a remarkably short time. AW: That sounds beautiful. When and where will the performance of Pasibutbut be, if our audience wants to come hear it in person? JH: Pasibutbut will be on our third concert, Sunday, August 5, 2018 at 4:00 PM at the Piedmont Center for the Arts. You can find more info here: Prayers and Celebrations. This year, each of our three feature concerts has a theme focused on the power of words and music, and sometimes of the intersection. AW: I have to say that as an audience member I really appreciate the way that you speak about your programs in your introductions to the performances. It makes it really accessible! Is there anything that you hope your audience members experience when they attend your performances? 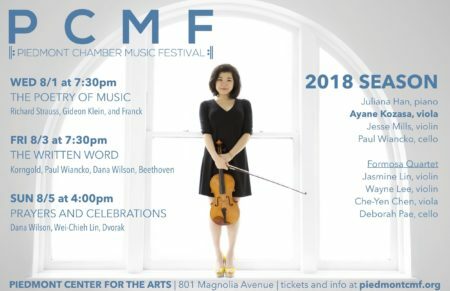 JH: At PCMF, we like to program a diverse and exciting range of chamber music, from the Beethoven and Dvorak that we all already love, to pieces by Jay and Paul Wiancko (a cellist at the festival) that we newly love upon hearing! WL: We hope that our audience members can enjoy the experience on any number of levels! If you’re coming to a concert like this for the first time, we think it would be a stimulating, non-intimidating experience. We try to be thoughtful about how we put our programs together so that it’s a coherent mix of old and new. And if we’re allowed to say so, we think that the level of the performances is as high as you can find anywhere. AW: I agree! I would love to talk about each of your stories and what brought you to music. Many Asian American kids grow up playing violin and piano, but not very many people in general can land a spot at Juilliard, the pinnacle of all music conservatories. Wayne, what was your experience of pursuing a career as a violinist? And, though it’s an overasked question, what did your parents think of the pursuit? WL: I don’t think I had a stereotypical experience – no tiger parents in my family! My dad got a violin for his 15th birthday and was really into it for a while, so when I was very little, they bought an upright piano and I started picking out tunes on it. I think I started piano lessons when I was 3 or 4 and violin when I was 6. Both my mom and dad were very supportive of the pursuit. As part of the deal, I had to practice two hours a day the whole time I was growing up – which isn’t a lot compared to what many of my colleagues did when they were kids – but other than that, there wasn’t much whip-cracking involved. AW: Was there a point where you decided to turn violin into a career and not just an extra-curricular activity? WL: Again, not a typical experience, but I don’t think I had that moment of conscious decision-making. I had gotten a certain amount of recognition as a violinist from a young age, and everyone sort of assumed that I would go into music professionally. Things could easily have gone off the rails for me, but I’m lucky because I still like what I’m doing! AW: That’s great, and it sounds like your whole experience has been rooted in a love of music, which is really wonderful, and yet easy to lose sight of. Juliana, your path has been much more convoluted. You started playing piano at a young age but then went on to study biochemistry at Harvard, work in consulting at LEK, study Law at Harvard, work at a top law firm in NYC, and only then did you decide to go back to piano, at Juilliard no less. Did I get all of that correct? I mean, a lot of people take winding paths in life, but so rarely do they do it at the top of each field. What has this journey been like for you? JH: It seems like a whiplash-inducing path, but I’ve realized that, up until my working at a law firm, it’s not an uncommon one. It takes a while for people to know what they want out of life. I was lucky that I had a very intense, all-consuming job at the law firm that made me think about this, and like many people, I just kinda flailed around to get out. Piano was the only thing that was remotely exciting to me (maybe because I felt like I had done enough “deskjob” time), so I took all of my accumulated vacation time at my law job, sat in my apartment and practiced for a few weeks, and auditioned for Juilliard! It’s a crazy idea, but somehow it worked. AW: Had you kept up piano through college and all of those intervening years? Was there something in particular that drew you back to music? JH: I actually quit piano for about 10 years. As a kid, I did a lot of competitions and only played solo piano music, and it burned me out. After I had “quit,” I went to college and ended up spending all of my time playing chamber music! A lot of my best friends from that time are amazing musicians who make their living in other fields. We all just played together becuase we liked to hang out and because we loved the music. I think chamber music revived my love for the piano. Even though I wasn’t practicing or taking lessons, that love for the repertoire ended up being just as important. AW: Love that. So, I have to ask, what did your parents think of you going from lawyer to pianist? JH: What else do Asian parents do? They worry. I wonder if I were now a law firm partner whether they’d still worry. I bet they would! But the world in which we live is so different from theirs. So many of our parents had ONE job which took care of their families and health and retirement. That’s just not reality for many of us these days. AW: Yes, and we’re seeing more and more vivid examples of people living their lives passionately in various ways these days. It’s something to be celebrated, I think. Congratulations to both of you on putting together this wonderful festival. I plan to see you there in August!